Laughlin, Nevada sits on banks of the Colorado River, just a short distance from Las Vegas. Laughlin, NV is a favorite destination for tourists who want to stay in a smaller, yet active, casino atmosphere. While Laughlin doesn't have the glitz and glitter found on the Las Vegas Strip, the more subdued surroundings are often preferred by those who want to just relax more than join the bustle of larger Nevada gambling cities. The Laughlin Entertainment Magazine provides tourism information provided by authorized affiliates. 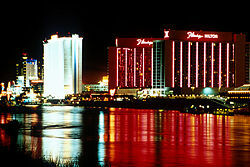 Find a selection of coupon web sites for discounts on hotels, buffets, travel and other Laughlin accomodations. Car Rentals Rent a car in Bullhead City, airport or Las Vegas airport and make the short drive to Laughlin. Dining Coupons Print Laughlin discount restaurant coupons before you arrive. Entertainment Show schedules, tickets and special offers. Find out more about Laughlin through our entertainment and destination guide. Hotels Laughlin NV hotel descriptions, rates and reservations. Maps Interactive Google Map of Laughlin. Zoom in to street level to familiarize your self with the area. Print out maps. Some places to visit nearby Laughlin are the Grapevine Canyon Indian Petroglyphs. Grapevine Canyon has the largest petroglyph collection in southern Nevada. Movies Laughlin movie theaters, showtimes, schedules, reviews and trailers. The gaming town of Laughlin is located 94 miles south of Las Vegas, Nevada. Bullhead City, Arizona is directly on the other side. Most people who work in Laughlin live in Bullhead City. Laughlin is the third most visited city in Nevada. Laughlin: wikipedia. © 2016-2019 Laughlin Entertainment Magazine EMOL.org. All rights reserved.